Identifying distinctive gait patterns in patients with MS, based on a combined evaluation of kinematics, gait features and muscle activity during walking, and determining the clinical relevance of these gait patterns. Cross-sectional study in 81 patients with an age range of 28-69 years, and mild to moderate severity of MS (median Expanded Disability Status Scale 3.0; EDSS range 1.0-7.0). Patients participated in 2D video gait analysis, with concurrent measurement of surface electromyography (EMG) and ground reaction forces. A score chart of 73 gait items, was used to rate each gait analysis. A single rater performed the scoring. 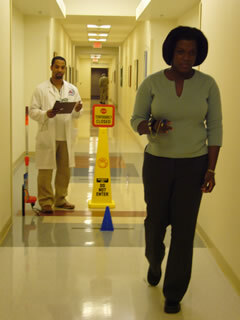 Latent class analysis (LCA) was used to identify gait classes. Analysis of the 73 gait variables revealed that nine variables could distinguish three clinically meaningful gait classes. These are heel-rise in terminal-stance, push-off, clearance in initial swing, plantar flexion position mid-swing, pelvic rotation, arm-trunk movement, activity of the m. gastrocnemius in pre-swing, M-wave and the propulsive force. The EDSS score and gait speed worsened in ascending classes. Most participants had mild to moderate limitations in walking ability according to the EDSS, while the number of severely limited walkers was small. Based on a small set of nine variables measured with 2D clinical gait analysis, patients with MS could be divided into three different gait classes. The gait variables are suggestive of insufficient ankle push-off.